Why did I decide to write this guide? Over the last number of years, I have had literally hundreds of interactions, verbal and written, on almost every topic imaginable related to moving to Ireland. I've spoken with students, families, retirees, job seekers, pet owners, entrepreneurs, and every other conceivable type of immigrant to help with their concerns. I've had conversations with housing agents, bankers, immigration attorneys, officials in multiple government agencies, and many other kinds of organizations, in an attempt to get answers and solutions to your issues. While reaching out to groups such as those mentioned above is often necessary to get the information we need, wherever possible I try to provide answers to you that are based on first hand experiences. My 5 international moves affords me a unique ability to do just that. The one downside of being the central point for all of this information is that so much of it is dispersed throughout the website, in notes I personally keep, in emails, and elsewhere (you wouldn't believe how many e-notes I have typed up, waiting to be shared!). Some of the information is just floating around in my head, waiting to be written down. All of that makes it very difficult, and in some cases impossible, for you to find it. With this guide I hope to change that! I want you to be able to quickly find reliable answers and the information you need to make your move to Ireland as hassle free as possible. And, as it is available as a PDF download, it makes for easy searching and printing. Why is there a fee to download this guide? Unlike the other blog posts on this website, I decided to ask for a nominal fee to download this guide. There are a number of reasons for this. For one, I really need your support to keep this website online. There are significant running costs, and a substantial time commitment on my behalf, to keep this website running. Asking for a nominal fee for this guide affords me the ability to continue to offer 99% of the content on here absolutely free of charge. The is super important to me. Your support let's me know that you put your trust in me, which gives me the encouragement to keep bringing new topics, posts, and information to you as often as I can. Thank you! How will you benefit from this guide? 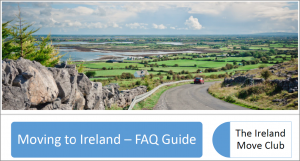 For those of you, who are not moving to Ireland, and have stumbled on this website for some other reason, then this guide probably isn't for you. However, for those of you that actually are moving to Ireland then this guide is going to be very useful in many ways. It'll give you clear answers to many of the most frequently asked questions countless others, just like you, have had. And, best of all, those answers are based on the experiences of others who have moved to Ireland. It will save you significant amounts of precious time that you would otherwise spend digging for information around the internet. It will give you confidence in knowing that decisions you make are based on a reliable source. Is there anything better than that? I'm really excited to finally make this one-stop-shop informative guide available to you!